The day has officially come and I couldn’t be more excited!!! Early in 2017, I designed the Jessica Top garment with the intent to never write up the pattern. At that time, I had felt such an intense pressure to write up patterns consistently and that pressure really affected me. Stress, anxiety and feeling overwhelmed are constants for me and I've had to learn new ways to take better care of my psyche. I found myself not looking forward to playing with my yarn due to knowing that it would lead to a hounding of questions asking for when the patterns would be released. So, I created the Jessica Top as a way for myself to create something that maybe was a bit more complicated for me at the time, but not have to worry about the technicalities of writing it all out. All I wanted to do was MAKE something, for myself. This was just so freeing for me! I loved being able to just pick up the hook and yarn, stitch away without keeping notes, and just see what ended up being made! Sometimes I find myself hindering my own designs simply because I know that I'll have to explain how to do it for the pattern. Sometimes this is difficult when design elements I want to do aren't "following the rules" or I just kind of make things up. When wanting to put out a professional pattern for your designs, it feels really cumbersome to have that limitation. So, I made the Jessica knowing I wouldn't have to worry about notes, numbers, explanations or really anything other than the sole enjoyment of creating. For this design, I used We Are Knitters The Cotton made of 100% Peruvian cotton which allows for a beautiful and slinky drape while the fiber also naturally offers breathability. The front panel has a ‘closed’ design with intentional bobble placement creating a fun ‘arrow’ shape. The back panel is designed to be more ‘open’ with a mesh-style stitch sequence which, I feel, really balances the heaviness of the front panel. The pattern is written to be a cropped top and can be worn with high-waisted pants, skirts and the like! Or, you may opt to elongate the body panels to create a longer-fit design which works great for those with a larger bust, longer torso or just a simple interest in allowing it to fit longer! I sure hope you all are as excited as I am with this release - it’s sure been a long waiting game, hasn’t it?! I can’t wait to see all of the colors you choose, be sure to check out these amazing versions my testers created! They are all so talented! Feel free to click on the image to visit their Instagram pages! -@the.hook.nook : full of fiber inspiration, new patterns a little more personal posts from Jessica/me! -@thn.life : Our designated Featured Maker page! Want to be featured? Simply share your images on Instagram use #thehooknookers for a chance to have your image shared with our growing community! 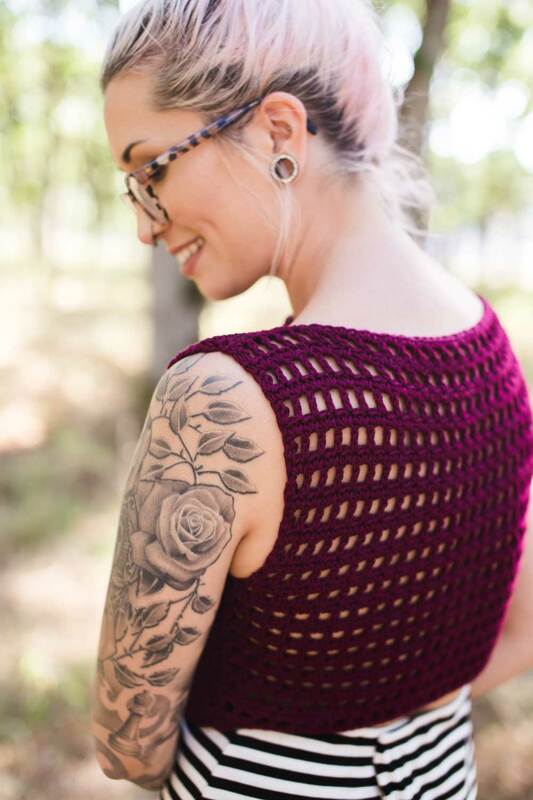 Be sure to share this page with your friends, we are just getting it up and going but want to be able to share more than just fiber inspiration! Our goal is to showcase the VAST creative abilities across many genres of Makers to promote how wonderful it is to be a Maker - no matter what kind of Maker you are! You guys mean so much to me and I am so grateful for your years of support and encouragement and am so elated to get this pattern out into the wild for all of you to explore more creativity! You guys ROCK! !